A parachutist is caught in what appears to be power lines. Annotated on the front margin: Anyway, they slow you up. 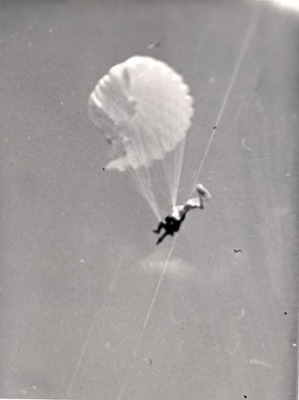 On back: Malfunction: Notice the leg over the left group of suspension lines collapsing that half of parachute. Reserve chute has just begun to come out.